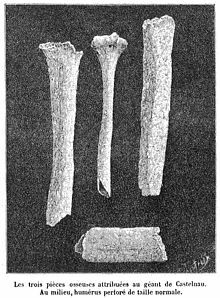 Three bone fragments of the alleged "Giant of Castelnau" compared to a regular size humerus (centre), after Georges Vacher de Lapouge. The bones were discovered by the anthropologist Georges Vacher de Lapouge at the Bronze Age cemetery of Castelnau-le-Lez, France in the winter of 1890. His findings were published in the journal La Nature, Vol. 18, 1890 Issue 888. The height of the individual was estimated at about 3.5 m (11 ft 5 in) according to de Lapouge, and the bones were dated to the Neolithic period, since they were found at the very bottom of the Bronze Age burial tumulus. The journal includes a photo engraving of what was identified as the humerus, tibia, and femoral mid-shaft of the giant compared to a normal size humerus in the center. Writing in the journal La Nature, de Lapouge describes the bones in detail: "I think it unnecessary to note that these bones are undeniably human, despite their enormous size.... The first is the middle part of the shaft of a femur, 14 cm length, almost cylindrical in shape, and the circumference of the bone is 16 cm.... The second piece is the middle and upper part of the shaft of a tibia.... The circumference is 13 cm at the nutrient foramen.... the length of fragment is 26 cm.... The third, very singular, was regarded by good anatomists as the lower part of a humerus.... The volumes of the bones were more than double the normal pieces to which they correspond. Judging by the usual intervals of anatomical points, they also involve lengths almost double.... The subject would have been a likely size of 3m, 50." The bones of the Castelnau giant were studied at the University of Montpellier and examined by M. Sabatier, professor of Zoology, at the University of Montpellier, and M. Delage, professor of paleontology at the University of Montpellier, in addition to other anatomists. In 1892 the bones were carefully studied by Dr. Paul Louis André Kiener, professor of pathological anatomy at Montpellier School of Medicine, for which he admitted they represented a "very tall race", but nevertheless found them abnormal in dimensions and apparently of "morbid growth." It is of some interest that in 1894, press accounts mentioned a further discovery of bones of human giants unearthed at a prehistoric cemetery at Montpellier, France (5 km southwest of Castelnau), while workers were excavating a water works reservoir. Skulls "28, 31, and 32 inches in circumference" were reported alongside other bones of gigantic proportions which indicated they belonged to a race of men "between 10 and 15 feet in height." The bones were reportedly sent to the Paris Academy for further study. ^ a b de Lapouge, G. (1890). "Le Gėant Fossile de Castelnau". La Nature. 888: 11–12. Retrieved 27 December 2010. Le sujet aurait une taille probable de 3m, 50 [11 ft 5.8 in]. ^ "A Prehistoric Giant". The Popular Science News and Boston Journal of Chemistry and Pharmacy. 24 (8): 113. August 1890. Retrieved 2011-10-27. ^ "A Race of Giants in Old Gaul" (PDF). The New York Times. October 3, 1892. Retrieved August 31, 2011. ^ "Le géant de Castelnau". La Nature. 20 (992): 142. June 4, 1892. Retrieved 22 April 2014. ^ "The Princeton Union (Princeton, Minn.) Pg. 2". October 11, 1894. Retrieved August 31, 2011. ^ "Giants of Prehistoric France". The McCook Tribune (McCook Neb.). March 8, 1895. p. 3. Retrieved August 31, 2011.